Government has two clear sides to it, the operative and the narrative. The former presents the structures, processes and institutions of governance – the policy (legislative), administration (bureaucracy), and law (judiciary). The later represents the political process of influencing the public perception and seeking public votes in elections. Media is an integral part of this process. Though both are parts of a democratic government system, often disconnect between the two makes governance and politics compete with each other. Remember the fate of the Vajpayee government at the center and the Naidu government at the state in the early 2000. Both the respective governments were considered as fairly good and successful, yet the results were contrary to the popular perception. In short, the narrative and the operative were not aligned. Was it an apt case of good governance being equal to bad politics? Can governance and politics be well aligned? A country cannot progress if governance and politics are not well aligned, that is the operative and the narrative does not have a common link. India’s lopsided non inclusive growth in the last 60 years is a clear evidence of the same. Though the narrative has been around ‘poverty removal’ and social justice, the results have been disheartening. The wealth creation has been fairly limited to the top 10%, mostly in the urban areas and essential aspects of infrastructure, healthcare and education were being neglected at our own peril. No wonder we as a nation do not rank anywhere on transparency, ease of doing business, human capital index and many other parameters of growth and development. However, things seem to be changing for good now. 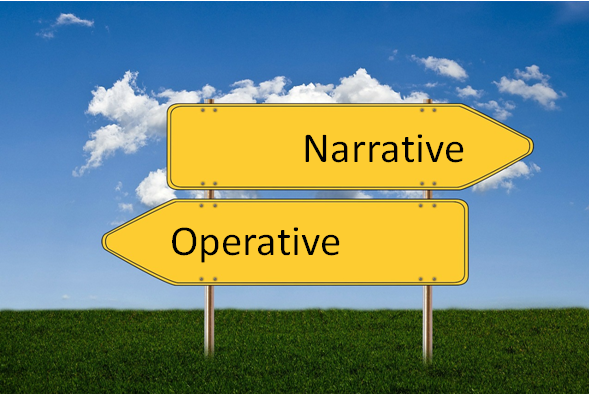 The gap between the operative and the narrative is attempted at being bridged and aligned. And digital is emerging as a big catalyst in doing so. Though a lot more is required for narrative and operative to go together, a good start seems to have been made. The central government’s focus on Aadhaar, Jan Dhan and other social schemes as the bedrock of equality and inclusion, and policy thrust by states through Right to Citizen Service’s charter are creating a conducive environment for governance. This is matching the narrative of pro poor and all inclusive image of the government. An equal thrust is being put on the business side through policy thrust on Make in India, Start up India, Ease of Doing business, Smart city initiative etc. To enable policy implementation more effectively, transformation of government departments through digitalization and capacity building is undertaken on a large scale. Most of the central and state government departments are working on utilizing IT infrastructures of SDCs, SDNs, NSDG, SSDG and the structural resources like NIC and CSCs to build capacity to deliver citizen services. Though at a nascent stage, citizen participation is sought in policy formulation. Going forward we can expect to see a lot of citizen empowerment to prod administration to deliver. More and more central departments and state governments are putting data in the open for the citizens, social activists and media to see and act upon. Today, it’s a common place to see news and adverts on what the government has achieved. Though still nascent, the narrative seems to carry the message of good governance. I believe that with digital enabling information empowerment of the key stakeholders – the political leaders, government administrators, citizens, media, developmental agencies, and social activists, the gap between the narrative and the operative shall be bridged over time.